The box of papers, now at Hesed. Photo © 2011 Jay Osborn. Today we went to Hesed-Arieh of Lviv to meet with Hesed Director Ada Dianova and Mr. Yaremkiv of Rohatyn. The purpose of the meeting was to be present for the donation of the box of Jewish papers and scraps to Hesed’s Museum by Mr. Yaremkiv, the Rohatyn Director of the Internat (boarding school for children). You will recall that Mr. Yaremkiv had collected and saved these hundreds of scraps found during the recent renovation of the school buildings. These buildings have historic significance for many of our families because they were located in the Rohatyn Jewish ghetto under the Nazi occupation; one of these buildings housed the Judenrat, another was a synagogue before the war. We were accompanied by Anna Denysenko, the daughter of group member Alex Denysenko, who is away on business. Anna acted as translator and facilitator of the meeting. 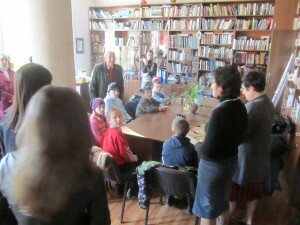 Mr. Yaremkiv with his students in the Hesed library. Photo © 2011 Jay Osborn. We arrived at Hesed-Arieh at about noon. In addition to Ms. Dianova, also present from Hesed was Olga, the Museum Director (who we met last time) as well as Librarian Director Olga Fadeeva. Mr. Yaremkiv had come to Lviv earlier today by bus with about eight of his Rohatyn students (aged 8-12 years old) as an educational field trip. Their day included a visit to Hesed-Arieh where they would get a tour of the Museum and hear about Jewish life in Lviv and other Ukrainian towns prior to the War. I am guessing for many of these youngsters, it was the first time they were seeing torahs and other artifacts of daily Jewish religious life. 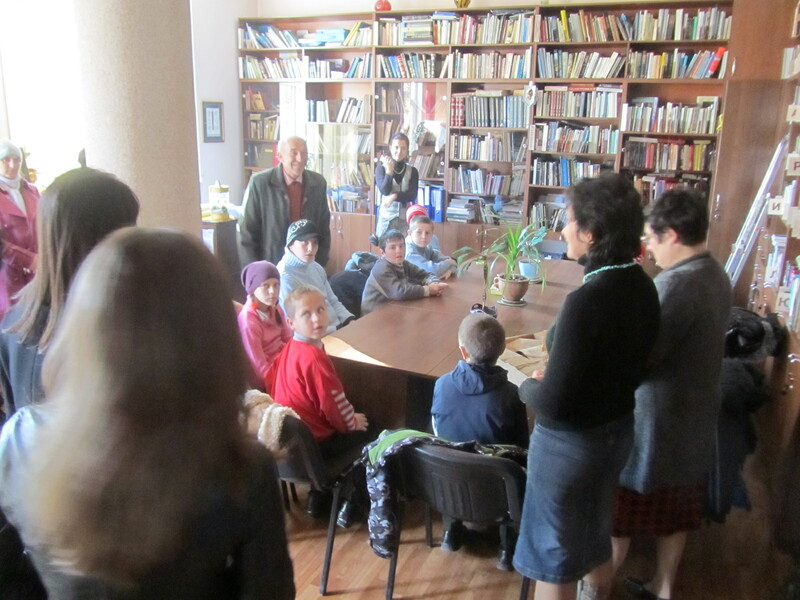 When we arrived, the students were already seated around a long table in the upstairs library and Mr. Yaremkiv was speaking to them about the box of Rohatyn Jewish papers. They were intensely listening. Explaining the papers to the students. Photo © 2011 Jay Osborn. A few brief introductions were made by Anna and Ms. Dianova about our Rohatyn group and the historic significance of the papers. The children then filed past us to get a tour of the Museum. Unfortunately, power was lost to the building sometime before we arrived, so the tour had to be conducted by candlelight, but the children did not seem to mind and perhaps were even more intrigued. Once the children had left the room, we remained to speak with Ms. Dianova and Ms. Fadeeva about the future of the box. Ms. Dianova said that it was Hesed’s plan to scan and translate as many pages as possible. This, of course, is a big, big project – as there are many tiny, fragile pieces of paper – and because Hesed already has many outstanding projects, with limited staff. I told Anna that, if need be, we would consider hiring her to go to Hesed to help with the scanning process. Reviewing the papers with Hesed staff. Photo © 2011 Jay Osborn. Ms. Dianova said that the scanned images would be posted to Hesed’s website once completed, and promised to let me know when that happens. She also promised to make the box available to anyone from our group coming to Hesed, upon prior arrangement. Before leaving, we made another small donation. On behalf of our group, we thanked both Ms. Dianova and Mr. Yaremkiv. Candidly, I felt a touch of sadness as we left Hesed and walked home – perhaps because a piece of nearly-lost and -forgotten Rohatyn history – our history – now no longer physically resides in Rohatyn, as it has for the last 70 years. 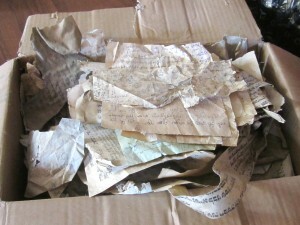 At the same time, however, I also felt calmness and relief in knowing that the papers are a little more likely to survive the ravages of time in the care of Hesed than where they have been. I know I speak for everyone in our Rohatyn group when I say that we owe much to Mr. Yaremkiv for having had the foresight and historic appreciation to have single-handedly assumed responsibility for gathering and saving these fragments of our common Jewish past. In other news, with regard to the Rohatyn private garden (near the library on Ivan-Franko Street) where Jewish headstones are buried, I am advised by Abe Lyons, the Peace Corps volunteer in Rohatyn, that the recovery of the headstones was delayed the last few weekends due to bad weather and then the failure of the crew to show up. Abe believes that work will begin over the next few weekends, when the garden will be plowed, the headstones removed, then moved to the new Jewish cemetery to join the others found to date. Mr. Vorobets is personally coordinating this, and Alex Denysenko has generously agreed to act on behalf of the group in our absence. To the extent that the fund we left with Mr Vorobets gets exhausted (as I fully expect it will in 2012 – see my last posting to the group from our 12 October visit), we will notify the group about replenishing it. In the meantime, Alex Feller is looking into starting a Rohatyn account into which donations can be made. So, after living for five months in Lviv (on and off) and making six trips to Rohatyn this year, we leave Ukraine on Thursday morning. This has been a tremendously enriching, life-changing experience for us; and there is one person more than any other whom we wish to thank for this opportunity: Alex Denysenko – for his generosity in making an apartment available to us to rent, for joining us on several Rohatyn visits (including those with Alex Feller and Mitchell & Dori Glotzer) plus trips to Odessa and other Ukrainian towns and cities. Most of all, for becoming our good friend. Thank you, Alex. Jay and I fly from Lviv to Warsaw to Paris on Thursday where we will spend four days before flying to the San Francisco Bay Area and the bedroom we maintain at a friend’s house in Dublin. We hope to return to Europe in March 2012. For the next few weeks, we plan to take some time off – to rest and to spend time with family we have not seen for over eight months. I can sincerely say that we will miss this lovely, historic city named Lviv, and Rohatyn. Ah, Rohatyn!